To meet the growing needs of our customers with remote sites, outside yards, and supplemental campuses without wireless coverage, BCC Distribution has developed a “Store & Forward” version of TranASAP™. TranASAP™ version Store & Forward (also known as online/offline for data collection) provides direct, real-time connectivity with the same reliability and the ease-of-use experience that BCCD customers have grown to expect from their SAP-based RF scanning systems, with the added capability for a seamless and automatic transition for OFFLINE use. 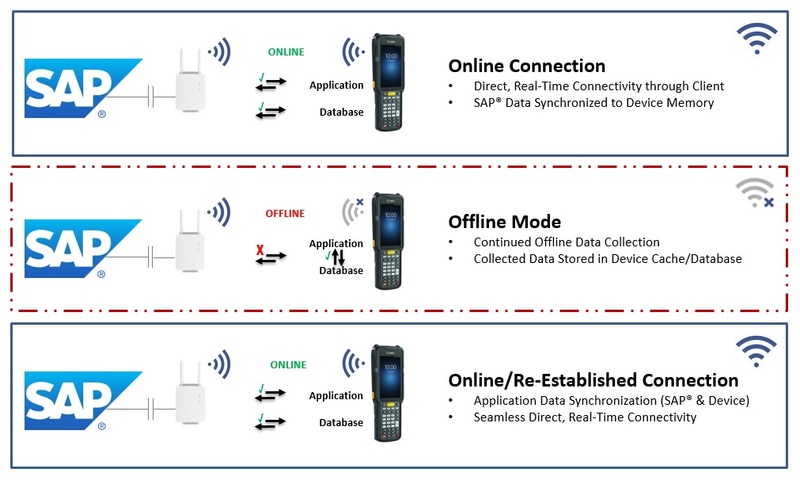 When the user returns to the wireless network, TranASAP™ Store & Forward will again seamlessly transition back to online mode, to include automatic data synchronization from the RF device to SAP® and from SAP® to the RF device. Version Store and Forward is identical to other versions of TranASAP™- a SAP-certified pre-configured software product for inventory control that mobilizes SAP® transactions for RF scanning. All versions being a software solution that combines BCCD’s mobile software transactions, RF/barcode equipment, SAP® software and inventory control best practices. TranASAP™ Store & Forward reduces or eliminates concerns associated with spotty wireless coverage, minimizes additional investments required with adding more access points, and enables the IT/architecture team to extend the RF scanning system’s capabilities beyond the boundaries of the wireless infrastructure. TranASAP™ Store & Forward is built on an SAP-certified application development platform. BCC Distribution utilizes our inventory and warehousing best practices for SAP® to enable BCCD to deliver and maintain TranASAP™ Store & Forward for both real-time/online and offline use. TranASAP™ Store & Forward has been designed to further automate and optimize SAP® inventory control with the goal to further increase business efficiencies, maximize local and satellite inventory accuracy, and reduce operational and warehousing costs.